Notes: This patterm was designed by Sierra Guide Dan LeCount for the Truckee area and was featured in Bud Bynack's "At the Vise" column in the May/June 2013 issue of California Fly Fisher magazine. Dan developed this pattern around 2010 as an effort to come up with something different to interest the heavily angled trout of the Truckee area. His inspiration came from Gary LaFontaine's Diving Caddis. During the summer months, the caddis would primarily dive into the stream during the morning and afternoon hours, emergence didn't take place until the evening hours. 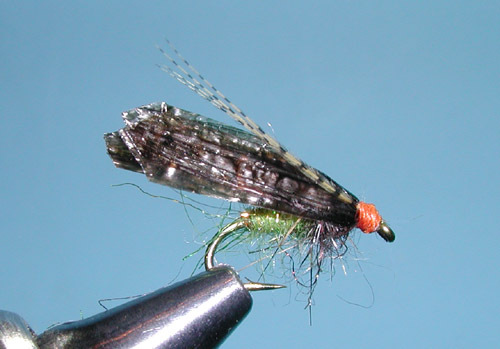 Dan noticed that the wings of diving Caddis had a flat metallic shine that would twinkle as the caddis moved downwards. Through trials, Dan found that multiple layers of Medallion Sheeting for the wings gave the reflective qualities he was looking for. Most of the construction of the fly pattern is within the dubbing. Dan blends a mix for the abdomen consisting of equal amounts of Hare's Ear, Insect Green Hare's Ear Plus, and Caddis Green Ice Dub. Then, he adds sparse amounts of Olive and Caddis Green Antron Yarn cut into 3/4" pieces and teased out into separate strands. This is blended together for a mottled blend that can be adjusted for color. The thorax portion is a blend of Hare's mask, Squirrel, Hareline Dubbing (Stonefly), and Chocolate Brown Ice Dubbing. Medallion Sheeting works best for the wings. The material was not available for a period of time but it has been reintroduced with some different colorations. The new material has a smoother surface that differs from the original. Try crinkling the material by compressing the material between your fingers. Then, lay it out and cut the size you need keeping the widths about the same as the hook gape. Gary LaFontaine's Diving Caddis has a similar Antron body utilizing Sparkle Yarn. Gary was an early proponent of Antron, which was a 3M product for the carpet industry. It has a trilobal cut that offers good reflectivity within the water. The wing consists of Partridge or Grouse fibers that are rolled and tied at the top of the shank. 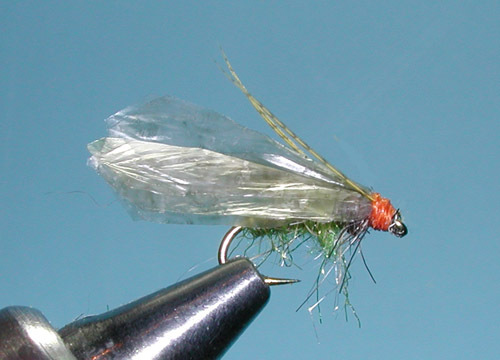 An overwing of Clear Antron was recommended by Gary for the high reflectivity he was trying to mimic from the natural caddis that would carry a bubble with them in the diving process. Clear Antron has been difficult to find. Many tiers will substitute with Fl. White Antron Yarn. Rooster Hackle is also unique to this pattern. 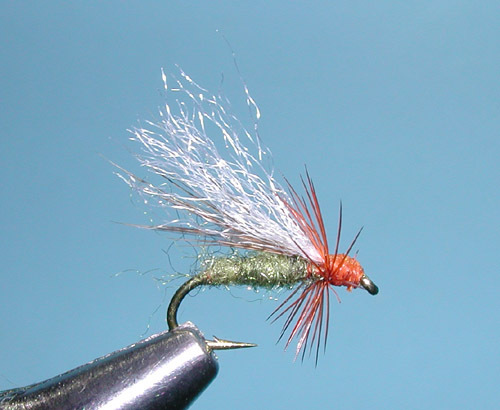 Rather than going with a soft hackle, he preferred a stiff rooster hackle that would vibrate through the current. This type of hackling can also be seen on the Hornberg streamer and the Wooly Worm. Gary used many color variations for the body of Rusty Yellow, Olive Green, Amber, Brown Black, Cream, and Rusty Orange. The Rooster Hackle and the underwing would vary in color complementary to the body coloration.